« Made in USA Steampunk Jewelry Made a great gift! My office manager recently ran across the ERA line of spray-on foundations and bronzers (made by Classified Cosmetics) as an addition to my medical spa’s products. She forwarded me the information and we decided to carry it. We already sell multiple skin care products but have so far shied away from selling cosmetics. Their ubiquity was one obstacle to bringing them on. 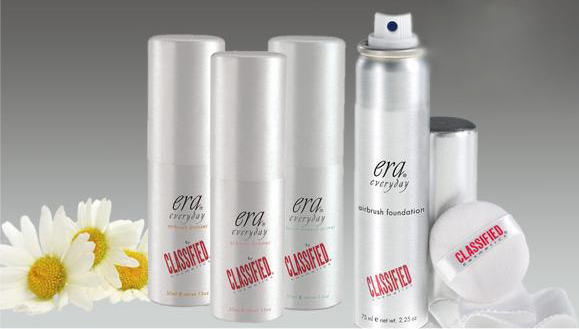 What I like about ERA, which has gotten quite a lot of recent fame from use on Twilight sets, is that it goes on like air-brushed makeup, so you’re getting professional level cosmetics in a take-home bottle. I also of course asked where it was made – right here in Southern California as a matter of fact. There aren’t that many domestically made cosmetics, though I’ve read that Smashbox and Glo Minerals are both made here. Whenever possible, I support domestically-produced products.